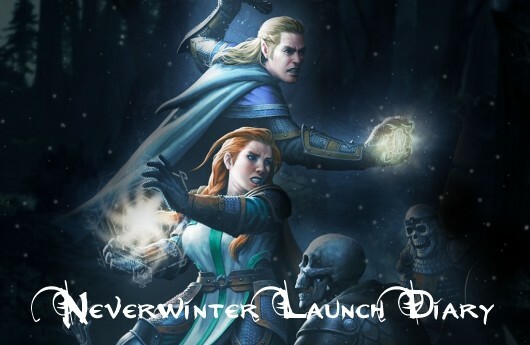 After yesterday’s initial foray into Neverwinter, I was eager to get back to it. I was still trying to figure everything out, including frustrating little issues (is there a screenshot key that saves to a folder? Can I keep the little notifications from constantly popping out of the side of the map?). There’s that period of acclimation in new games when you’re excited but also feel a little lost. I’m guessing it’s going to be another day or two before I truly feel comfortable in my Neverwinter home. 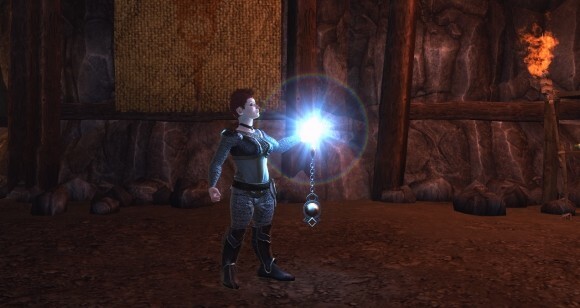 From what I can figure out, there are six main options for a typical Neverwinter play session. There are general PvE quests, skirmishes (think instanced public quests), zone-wide events, group dungeon runs, Foundry missions, and PvP fights. 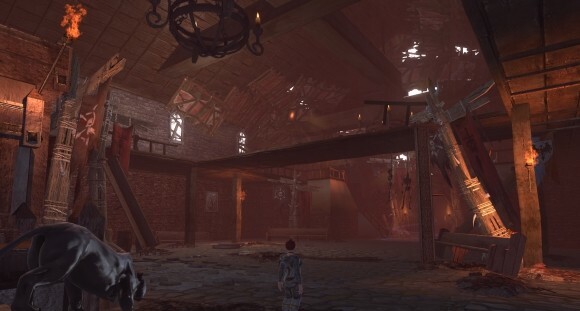 There’s also playing the auction house, crafting, and making your own Foundry missions. Yesterday was about the first two, so I decided that the second day would be all about the Foundry. At a certain level or part of the quest line (around level 11), you gain access to daily Foundry quests. These give you astral diamonds as incentive to run player-made content, so I figured I had nothing to lose and everything to gain! The Foundry mission that I chose was the second on the recommended list: Blacklake Gold. Once you pick up a mission, you can go into your quest journal (J) and click on the quest path icon to have the game show you where to go. In this case, I just had to zone into a different area and the mission took me right to a Dwarf mining establishment. After some amusing dialogue with the miners, I was sent down into dimly lit tunnels to put out fires and investigate why the elementals were all up in a tizzy. I grew pretty impressed with what the Foundry was capable of producing, from the dialogue trees and NPC emotes to a multi-stage dungeon that contained several objectives. The loot wasn’t bad, either, although I hear that the game rather than the mission designer generates that. All of the mobs were at-level with me, so I think (but I’m not 100% certain) that the Foundry scales to your level. If this is the case, then that’s terrific. It’s entirely possible that there are level-specific missions, but I haven’t seen them yet. I’m loving my choice as a Devoted Cleric, by the way. Being able to heal myself means that I scarcely ever need to bother with potions or worry about when I’ll be seeing a campfire again. Anyway, Blacklake Gold took me about a half-hour to run from start to finish. The author obviously loved creating a story, and the touch of humor was appreciated. At the end of it, I was given the opportunity to both rate it (I gave it four stars) and give a tip (I passed along 25 astral diamonds). Turning in the daily quest netted me 1,000 diamonds, so 25 was a pittance. I think it’s nice to be thanked for good work, don’t you? Around level 11, two new features started popping up. The first was the expected return of the notorious Cryptic lockboxes. As with Star Trek Online, you’re going to be seeing a lot of these. It’s a little mean how that purple text gets you excited before you realize that, oh, it’s just a lockbox. I’m not much for spending money to open them, but if I’m given a free key along the way, I won’t complain either. What really annoys me are the system messages that are broadcast game-wide whenever a player opens a lockbox and finds the rare mount inside. At least the message doesn’t fly across the screen and leave golden sparks in its wake, I guess. The other little feature is the ability to invocate. Every hour you can either perform this action at a priest or an altar. It gives you a stack of random goodies, including astral diamonds, so it’s definitely worth remembering. Of course, now I can see it’s an obvious temptation to keep me logged in! I think that once a day you get a couple of different tokens that can be used to purchase special goods, although any accumulated tokens vanish if you miss a day. While dungeon runs, solo and group, are quite fascinating to me, I’m less than thrilled with the extremely rote quests that litter the surface world. Kill 10 of this and collect 10 of that seems to be the filler between dungeon missions. That’s why I began to queue up for group content faithfully. First of all, kudos to Cryptic for putting in an easy-to-use group finder on Day One (unlike some other higher-profile MMOs that I could mention…). It’s quite simple to queue for skirmishes, dungeons, and PvP matches with this interface, and I appreciate that it tells me the estimated run-time of each of these activities. Sometimes a gamer only has a half-hour, you know? The skirmishes ended up being pretty fun 10-minute battles alongside four other players. I see it as good practice for how you should use your skills in a group without all of the pressure that a dungeon brings. I ran the Orc assault skirmish a couple of times and enjoyed smacking down the brutes, although I was unimpressed with the final chest that rewarded… a small handful of coins. Really? That’s it? I’m also a little irked by the loot roll popups that happen quite frequently in these chaotic battles. You don’t have a lot of time to take a break from fighting to check out what’s up for a roll, although you can tell if it’s usable by your class or not at a glance. I did like the hotkey shortcuts to enter your roll desire (need/greed/pass), although I was a little paranoid about “that guy” in the group who would wait until everyone hit greed so that he could ninja with a need. Past the skirmish, I saw a lot of folks in the zone complaining about the dungeon finder and how it wasn’t creating groups. We took a headcount of players in the area who had queued and came up with a dozen or so — far more than the five needed. So either the dungeon finder wasn’t working 100% correctly or it was an issue of roles missing (i.e., tanks). Eventually the finder did place me with a group, however, and I finished my second night by running the Clock Tower. Apart from one player whose mic was always on and constantly crackling (thank goodness you can turn down individual player volume), it was a smooth run with no wipes, and I healed as much as I could. I saw only two blue drops the entire time, and neither was appropriate for my class, so I went away feeling as if the dungeon had been kind of stingy. I think we had issues gathering the items necessary to open the last chest, but I’m not sure how that works. Anyway, in two days I’ve climbed up to level 16 and am feeling pretty positive about Neverwinter as a source of gaming enjoyment. The combat is quick, brutal, and sometimes tactical, and I definitely like the ease of entry to group content. The client performed admirably; I saw no glitches, experienced no bugs, and had no crashes. I still have a lot I want to experience in the first month, such as trying my hand at crafting, collecting companions, and perhaps making a Foundry mission of my own. But for two days, I think this was an excellent start.